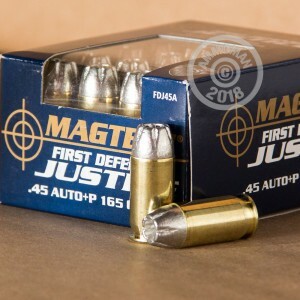 This .45 ACP ammunition is one of the fastest on the market thanks to a +P loading and a light solid copper bullet. Each cartridge in this 20 round box fires a 165 grain hollow point projectile at 1,100 feet per second, about 25% faster than typical .45 Auto range loads. This contributes significantly to enhanced penetration and more reliable expansion in self-defense situations. This ammo makes a potent carry load for full-size 1911s and other pistols rated for high pressure cartridges. 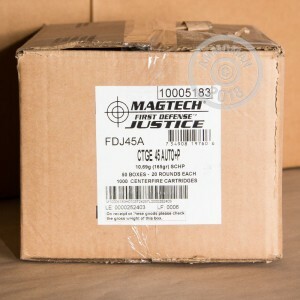 Magtech First Defense ammo is assembled in Ribeirao Pires, Brazil by CBC, a top Latin American defense contractor that also produces its own non-corrosive primers, propellant, and bullets. 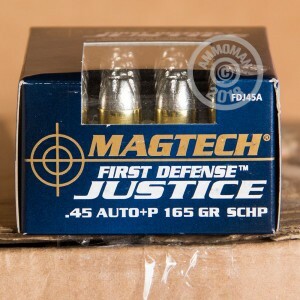 Unlike some other Magtech product lines, First Defense cartridges use nickel-plated brass cases for added durability over long periods of daily carry. Place an order for $99 or more at AmmoMan.com to qualify for free shipping!